Running an application within a Docker container helps in isolating the application from the host OS. 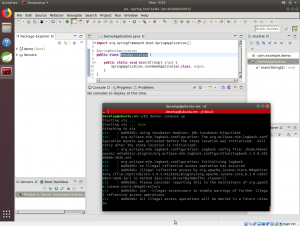 Running GUI applications like for example an IDE from a Docker container, can be challenging. I’ll explain several of the issues you might encounter and how to solve them. For this I will use Spring Tool Suite as an example. The code (Dockerfile and docker-compose.yml) can also be found here. Due to (several) security concerns, this is not recommended in a production environment. The container needs to be aware of the display to use. In order to make the display available, you can pass the DISPLAY environment variable to the container. docker-compose describes the environment/volume mappings/port mappings and other things of docker containers. This makes it easier to run containers in a quick and reproducible way and avoids long command lines. You can do this by providing it in a docker-compose.yml file. See for example below. The environment indicates the host DISPLAY variable is passed as DISPLAY variable to the container. After execution, during the session, root is allowed to use the current users display. Since the Docker daemon runs as root, Docker containers (in general!) now can use the current users display. If you want to persist this, you should add it to a start-up script. The last thing to do is sharing the X socket (don’t ask me details but this is required…). This can be done by defining a volume mapping in your Docker command line or docker-compose.yml file. For Ubuntu this looks like you can see in the image below. In order to give a complete working example, I’ll show how to run Spring Tool Suite from a Docker container. In this example I’m using the Docker host JVM instead of installing a JVM inside the container. If you want to have the JVM also inside the container (instead of using the host JVM), look at the following and add that to the Dockerfile. As a base image I’m using an official Ubuntu image. LABEL nl.amis.smeetsm.ide.name="Spring Tool Suite" nl.amis.smeetsm.ide.version="3.9.5"
The specified packages are required to be able to run STS inside the container and create the GUI to display on the host. Notice this docker-compose file has some dependencies on the host OS. 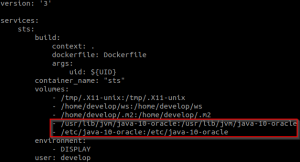 It expects a JDK 10 to be installed in /usr/lib/jvm/java-10-oracle with configuration in /etc/java-10-oracle. Also it expects to find /home/develop/ws and /home/develop/.m2 to be present on the host to be mapped to the container. The .X11-unix mapping was already mentioned as needed to allow a GUI screen to be displayed. There are also some other things which are important to notice in this file. First the way a non-privileged user is created inside the container. This user is created with a user id (uid) which is supplied as a parameter. Why did I do that? Files in mapped volumes which are created by the container user will be created with the uid which the user inside the container has. This will cause issues if inside the container the user has a different uid as outside of the container. Suppose I run the container onder a user develop. This user on the host has a uid of 1002. Inside the container there is also a user develop with a uid of 1000. Files on a mapped volume are created with uid 1000; the uid of the user in the container. On the host however, uid 1000 is a different user. These files created by the container cannot be accessed by the develop user on the host (with uid 1002). In order to avoid this, I’m creating a develop user inside the VM with the same uid as the user used outside of the VM (the user in the docker group which gave the command to start the container). When working with Docker containers, it is a common practice to avoid storing state inside the container. State can be various things. I consider the STS application work-space folder and the Maven repository among them. This is why I’ve created the folders inside the container and mapped them in the docker-compose file to the host. They will use folders with the same name (/home/develop/.m2 and /home/develop/ws) on the host. My Docker container with only Spring Tool Suite was big enough already without having a more than 300Mb JVM inside of it (on Linux Java 10 is almost double the size of Java 8). I’m using the host JVM instead. 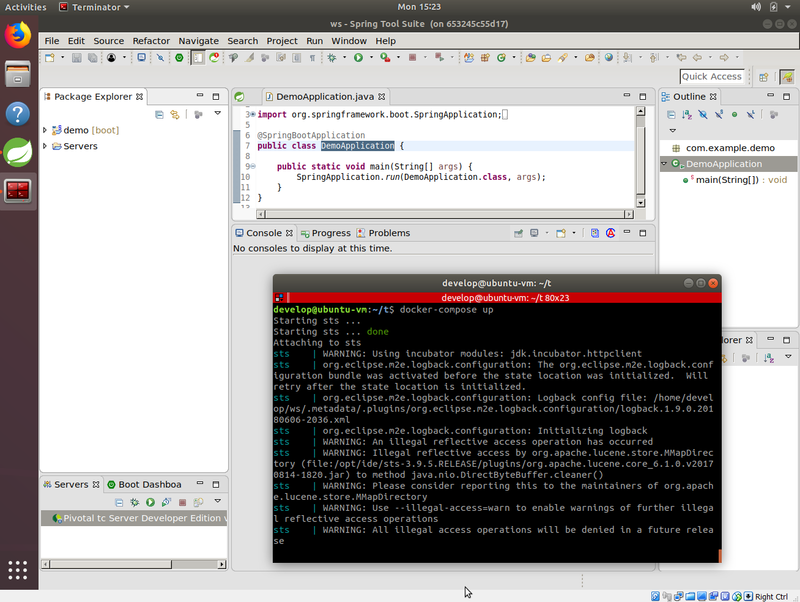 I installed the host JVM on my Ubuntu development VM as described here. 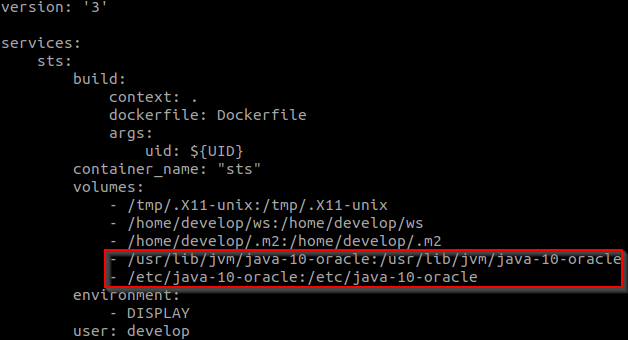 And map the JVM path to the JRE folder onder STS: ln -s /usr/lib/jvm/java-10-oracle /opt/ide/sts-3.9.5.RELEASE/jre. Step 4/10 : LABEL nl.amis.smeetsm.ide.name="Spring Tool Suite" nl.amis.smeetsm.ide.version="3.9.5"
When you run a Spring Boot application on port 8080 inside the container, you can access it on the host on port 8080 with for example Firefox.